The Sonos Playbar is the latest entry in Sonos’s line of streaming audio products. Some other soundbars—particularly at the high end of Yamaha’s Digital Sound Projector line—are far superior single-cabinet home-theater systems. But those models cost several times more than the $699 that Sonos expects to fetch for the Playbar (Yamaha’s YSP-4100 is priced at $1900, for example), and you can't incorporate any of those speakers into a whole-home audio system as you can the Playbar. The Playbar is dead simple to set up: Connect an optical TosLink cable to your TV, and plug the Playbar’s power cable into a receptacle. That’s it. If you want to stream music from a computer, server, or NAS box on your network, or from Internet music services such as Pandora, Rhapsody, or Slacker, either plug an ethernet cable into the Playbar or add a $50 Sonos Bridge to your wireless network and operate the speaker as a wireless component. You don’t even need the Bridge as long as one Sonos component is hardwired to your network. The 35.43-inch-wide soundbar can lie flat at the base of your TV, if your TV is in an entertainment center (measuring 3.35 inches high, it sat just below the glass on my 55-inch Panasonic Viera TE-55LE54), or it can sit mounted below or above your TV if your flat-panel is mounted to the wall. A sensor inside the cabinet detects the speaker’s orientation and triggers an onboard DSP to automatically reconfigure the speaker’s EQ settings to compensate. I’m pleased to report that the Playbar won’t add to your collection of remote controls. You use your tablet or smartphone to configure the device and to play music, and you use your TV’s remote to control the volume. The Playbar can detect the make and model of your TV based on the signal from its remote, retrieving the information it needs from Sonos’s online database. If your TV isn’t in that database, the Playbar will learn its remote and update the database for future customers. An infrared receiver on the front of the cabinet can also pass the remote’s commands through to an IR repeater on the back of the cabinet, which in turn sends those commands to your TV (because the TV’s IR receiver might otherwise be blocked by the Playbar). Nine speakers—six midranges and three tweeters—driven by nine discrete Class D amplifiers form a phased array that renders the Playbar more directional than would otherwise be possible from such small drivers. Tweeters mounted on the left and right ends of the bar give the speaker a very large sound stage that’s effective and enjoyable with both music and movie soundtracks. But you’ll never mistake the Playbar for a surround-sound system capable of fooling your ear into hearing audio events in particular areas of your room, and Sonos isn’t positioning it as such. 3D rendering of the Playbar's insides. The Playbar is capable of decoding Dolby Digital, but not the high-definition Dolby TrueHD and DTS-HD Master Audio codecs prevalent in Blu-ray Disc titles. Even if it could, TosLink doesn’t provide enough bandwidth to carry the bit stream from the TV, but that’s typical of less-expensive soundbars. Another feature that sets the Playbar apart from its competitors is its ability to replace the TV’s audio stream with other audio sources. If you’re watching your favorite team play an away game, for example, you can replace the broadcast play-by-play with that of your hometown announcer’s (provided that stream is available on one of the many services that Sonos supports). You can also use Sonos’s mesh network to stream the audio from your TV to other Sonos components in your house. This feature is handy when the news is playing in the living room while you’re cooking dinner in the kitchen. I watched several movies with the Playbar and listened to a number of music tracks that I’d ripped from CD and encoded in FLAC. When I watched the opening of Lars Van Trier’s mesmerizing film Melancholia, streamed via Netflix, the Playbar’s superwide soundstage flooded my home theater with music. Sonos doesn’t publish output specs for its amplified products, but the Playbar gets plenty loud without introducing distortion. When I switched gears to watch the Blu-ray version of Zack Snyder’s sci-fi epic Watchmen, I was pleased with the clarity with which the Playbar delivered Rorschach’s softly mumbled dialogue. But during the action sequences—from the fight scene early in the film to the destruction that Dr. Manhattan unleashes on the world near the end of the movie—I genuinely missed the presence of a subwoofer. 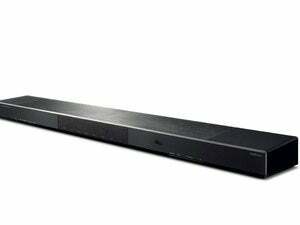 The Playbar isn’t devoid of bass response; in fact, it has a surprisingly robust low end. It can’t compete, however, with a speaker that’s purpose-built to deliver the kinds of rumbling low-frequency effects that resonate in your gut. You can get that kind of bass response by adding Sonos’s beefy $699 wireless Sub subwoofer to the mix, but that doubles the system’s price tag. If you want a true 5.1-channel audio system, you can also set up a pair of Sonos’s $299 Play3 self-powered speakers as surrounds. When Sonos demonstrated such a system for me in a San Francisco hotel suite, I was impressed with its performance; but the company didn’t provide such a system for me to evaluate in my own home theater. Sonos reps admit that few people will make a $2000 investment just to get wireless surrounds and a wireless sub. But they do believe that existing customers with Play3 units in other rooms in the house might bring a pair into the living room for movie night. Similar to other Sonos components, the Playbar can decode all of the most common audio codecs—including lossy ones such as AAC, MP3, and WMA, and lossless codecs such as Apple Lossless and FLAC—with up to 16-bit resolution and sampling rates up to 48kHz. Listening to Juliana Ray’s “Slowly,” from her Dominoes release, I thought the vocals and the piano accompaniment were overly bright and too far forward in the mix. The string bass, on the other hand, was surprisingly well rendered considering that the Playbar is not equipped with genuine woofers. I had better experiences with some of the other tracks I listened to, including Afro Celt Sound System’s “Deep Channel,” from that band’s Chorus album. But if you’re looking for a critical-listening system, you shouldn’t go down the Sonos path anyway. The company’s components deliver solid performance, but they’re not audiophile quality and they can’t decode high-resolution FLAC files (I’m talking about 24-bit, 96kHz tracks here). If you already have a traditional home theater audio system with an AV receiver, three or more speakers up front, a subwoofer, and two discrete surround channels, there’s no reason to switch to the Playbar; you’ll be disappointed if you do. If you’re considering pairing a soundbar with your HDTV, on the other hand, and you don’t mind giving up HD audio, the Playbar is one of the best options in this price range.